The Italian Regency of Carnaro (Italian: Reggenza Italiana del Carnaro) was proclaimed as a state by Gabriele d'Annunzio in Fiume (now Rijeka in Croatia) on September 8, 1920. The name was taken from the Golfo del Carnaro (Kvarnerski zaljev in Croatian), where the city is located. It was temporarily expanded by D'Annunzio in order to include the island of Veglia. The self-proclaimed State never received any recognition and in December 1920 it was replaced by the Free State of Fiume, that officially lasted until 1924. 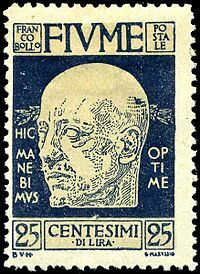 Gabriele D'Annunzio was angered by the proposed handing over of the city of Fiume at the Paris Peace Conference, and on September 12, 1919, he led the seizure by Italian nationalist and irredentists of the city, forcing the withdrawal of the inter-Allied (American, British and French) occupying forces. He was enthusiastically welcomed by the Italian population of Fiume. The plotters sought to have Italy annex Fiume, but were denied. Instead, Italy initiated a blockade of Fiume while demanding that the plotters surrender. D'Annunzio then proclaimed the city to be under the Italian Regency of Carnaro with a constitution foreshadowing much of the later Italian Fascist system, with himself as dictator, with the title of Duce. D'Annunzio ignored the Treaty of Rapallo and declared war on Italy itself, only finally surrendering the city in December 1920 after a bombardment by the Royal Italian Navy. The Charter of Carnaro or Carta del Carnaro, was a constitution that combined anarchist, proto-fascist, and democratic republican ideas. D'Annunzio is often seen as a precursor of the ideals and techniques of Italian fascism. His own explicit political ideals emerged in Fiume when he coauthored with syndicalist Alceste De Ambris. De Ambris provided the legal and political framework, to which D'Annunzio added his skills as a poet. De Ambris was the leader of a group of Italian seamen who had mutinied and then given their vessel to the service of D'Annunzio. The constitution established a corporatist state, with nine corporations to represent the different sectors of the economy, where membership was mandatory, plus a tenth corporation devised by D'Annunzio, to represent the superior individuals. The legislative power vested in a bicameral legislature consisting of a Council of the Best (Consiglio degli Ottimi) and a Council of Corporations (Consiglio dei Provvisori). Joint sessions of the Councils (Arengo del Carnaro), would be responsible for treaties with foreign powers, amendments to the constitution, and appointment of a dictator in times of emergency. The charter designated "music" to be one of the fundamental principles of the Fiume State.